I’m very proud to announce that next summer I will be releasing a brand new roleplaying game called Numenera. The game system behind Numenera, the Cypher System, is designed to be very simple to play and in particular to run as a GM, allowing the focus to be on role-playing, action, stories, and ideas. Numenera will be released under the Monte Cook Games banner. 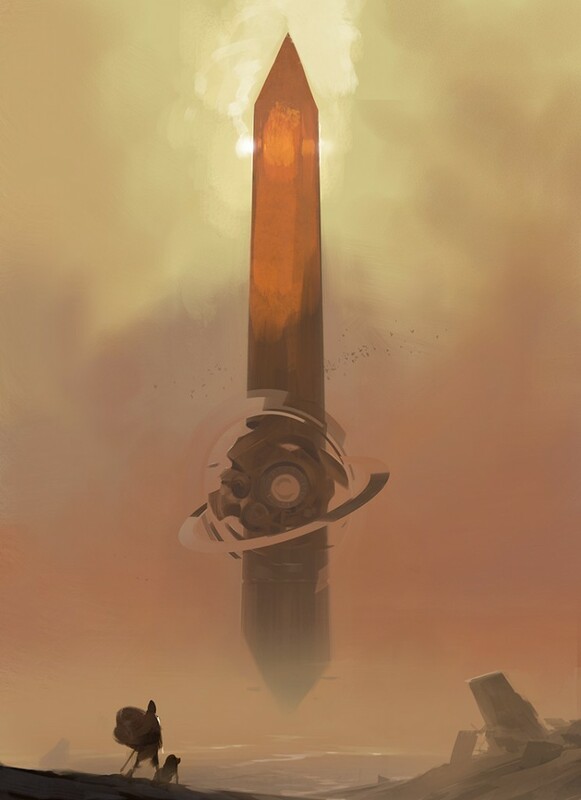 Numenera’s setting is Earth, a billion years in the future, after eight great civilizations have risen and fallen. Thus, the setting is also called the Ninth World. The PCs are part of a new civilization rising in the Ninth World, hoping to forge its own destiny. But they must do so amid the remnants of a remarkable and in many ways unknowable past. The ancient peoples of prior eras mastered nanotechnology, interstellar travel, cosmic engineering, genetic engineering, and far stranger things. If the people of the Ninth World think of such things as magic, who are we to blame them? Player characters explore this world of mystery and danger to find these leftover artifacts of the past, not to dwell upon the old ways, but to help forge their new destinies, utilizing the so-called “magic” of the past to create a promising future. 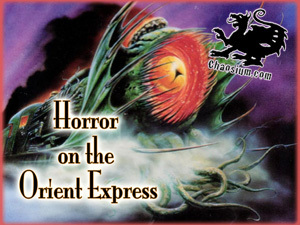 Chaosium is conducting a Kickstarter to update and re-release their legendary 1991 campaign, Horror on the Orient Express, for the Call of Cthulhu RPG. Set in 1920s Europe (the new edition will include rules for the 1890s too), the campaign arrives in London with a bizarre murder mystery, then runs to Paris and along the route of the Orient Express to a very terminal conclusion in Constantinople. Its storyline, centering on a bloodthirsty artifact, induces trainspotting-like fanaticism among many previous passengers, with original copies selling for hundreds on eBay. There’s even a soundtrack! Pledge perks include T-shirts, tote bags, bumper stickers, and other freight. Donate $60 or more to receive a hardcopy of the finished product. If you want to climb aboard but worry you’ve missed your connection, don’t — this high-speed rail already surpassed its goal of $20,000 six times over. Next stop: at $125,000, Chaosium will commission an anthology of Express-inspired fiction, featuring contributors such as Elaine Cunningham, Ken Hite, and James Sutter. Years ago I embarked on a play-by-post HotOE campaign and made it as far as Lausanne before the Keeper was derailed by personal commitments. My character was an American mob accountant who had skipped to Europe after embezzling from his employers, and the Keeper strongly suggested the vengeful bootleggers would appear somewhere down the line. Of course, he didn’t say when they would attempt to punch my ticket, which added a whole new layer of paranoia to a seriously creepy game. Fun times! I can’t be the only one out there with a young teen daughter who likes to read. I thought this would be easy. I’d give her a few books every month — books I treasured when I was her age, and carefully preserved for decades for just this moment — and she would retire in contentment to her reading nook, only popping out from time to time to comment on what a great Dad I am. Piece of cake. Didn’t exactly work out like that. Fortunately, I have people. People who work for publishing companies, and send me advance proofs. Of books that aren’t even out yet. Take that, bratty thirteen-year-old mean girls. I can still compete for my daughter’s attention by leaving these lying around. She pretends not to be interested, but then picks one up. What’s this? she sez. Oh, that? 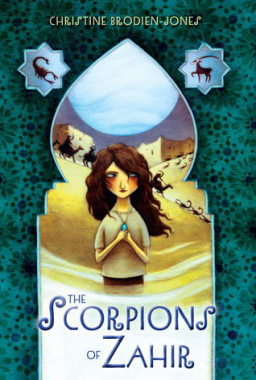 The Scorpions of Zahir — just something some Manhattan publishers sent over. You wouldn’t be interested. Won’t even be on sale for another month or so. It’s about a girl in Morocco trying to keep a sacred city from being buried forever, or something. Your friends probably won’t be talking about it for weeks. I know. I’m a bad person, but I’m desperate. And it works. Soon she’s curled up in her reading nook. She doesn’t come out to tell me I’m a great father or anything, but once she does ask where “Morocco” is. I show her on the map. We almost make eye contact for a moment, before she goes back to reading. I get a quick hug the next morning. The book is tucked into her bag as she heads off to school. I’ll need to have a new book by the end of the day, but I’ll worry about that later. Heaven help me when she turns sixteen. But this morning I’m a cool Dad again. Treasure the small victories. 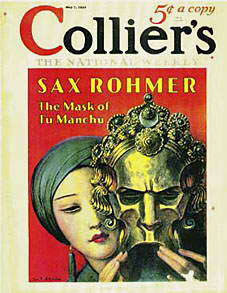 Sax Rohmer’s The Mask of Fu Manchu was originally serialized in Collier’s from May 7 to July 23, 1932. It was published in book form later that year by Doubleday in the US and the following year by Cassell in the UK. It became the most successful book in the series, thanks to MGM’s cult classic film version, starring Boris Karloff and Myrna Loy, that made it into theaters later that same year. Paramount’s option on the character had been exhausted after three pictures and one short starring Warner Oland as the Devil Doctor. The Paramount series had been responsible for Rohmer’s decision to revive the character with Daughter of Fu Manchu. 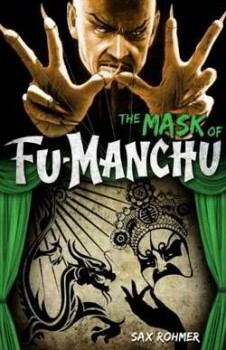 The Mask of Fu Manchu served as a direct sequel and was again narrated by Shan Greville. The novel gets underway with the brash Sir Lionel Barton having recently joined a colleague, Dr. Van Berg, in completing an excavation of the tomb of the notorious heretical Masked Prophet of Islam, El Mokanna, in Persia. Shan Greville, Sir Lionel’s foreman, is awakened in the middle of the night by his fiancée Rima Barton, Sir Lionel’s niece, who was disturbed by a strange wailing. Upon investigating, Dr. Van Berg is found dead in his room, his corpse slung over the jade chest containing the artifacts from the dig. The artifacts, still intact, are El Mokanna’s gold mask that hid his disfigured features, his heretical New Creed of Islam carved on gold tablets, and the bejeweled Sword of God with which the messianic prophet planned to conquer the world. As it may have been with you, for me it all started with the original Universal Studios’ monster movies. Naturally, meeting someone associated with one of these films is the Goth Chick equivalent to winning the lottery; especially as those individuals who still are around to meet often do not venture far from the sunny and warm climates where they have retired. Last weekend, Christmas came early when two of my all-time favorites from vintage Hollywood horror found their way to Chicago to attend The Hollywood Show. Ms. Julie Adams, whose very presence and bearing makes you want to call her ma’am, is best known to many for her portrayal of bathing beauty Kay Lawrence in Universal’s 1954 classic The Creature from the Black Lagoon. Admittedly, my knowledge of Ms. Adams’ fifty-seven year career was extremely limited which she teasingly pointed out. I wasn’t just the bit of cheesecake in the Creature movie you know. I actually worked with Elvis too! Last winter, I saw an excellent game on Kickstarter called Empires of the Void (Amazon). I was fairly new to Kickstarter, however, so didn’t actually back it at the time because I was hesitant about how the whole process worked. When I caught a glimpse of the game at GenCon, however, I was very impressed with the production values and wish I’d gotten it … because the Kickstarter discount turns out to be nearly 50%. I’m not going to make that mistake again. Empires of the Void‘s creators, Red Raven Games, now has a second Kickstarter going. 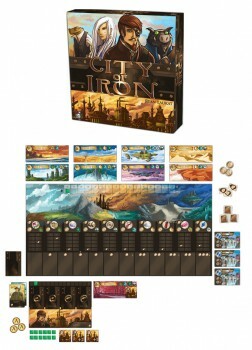 City of Iron is a steampunk-themed board game, complete with bizarre races, exotic lands (including floating islands), airships, and yes, even bottled demons. That’s right: one of the game’s many resources are bottled demons. I stumbled on a report at The Comic Reporter this week that Cerebus creator Dave Sim — at one time my favorite comic writer and artist — has announced that he’s ending his latest ongoing title glamourpuss and giving up on the medium entirely. Part of the reason I find it troubling is that I’ve never even heard of glamourpuss. How could Dave Sim publish 26 issues of a comic without me knowing about it? I’d heard about his successful Kickstarter campaign back in June, which raised nearly $64,000 to create a special audio/visual digital edition of the Cerebus graphic novel High Society. I also knew he had experimented with an anthology titled Cerebus Archive and a web program called Cerebus TV… but how did he slip glamourpuss past me? According to what I can find online, glamourpuss was both a parody of 60s fashion magazines and a history of photorealism in comics, masquerading as a surreal super-heroine comic. One of its most talked-about features was an ongoing storyline about the day comic artist Alex Raymond died, The Strange Death Of Alex Raymond. The art samples published online looked stunning. You can view page samples and purchase of most of the back issues at the excellent comiXpress site. The cheap shots are kind of tempting — analogies, or allegories even, about the SAT as a form of gladiatorial combat. Some of my students do experience the test that way. Certainly the SAT has become a fasting ordeal, now that it’s four hours long and still allows only one break long enough for scarfing down an energy bar. 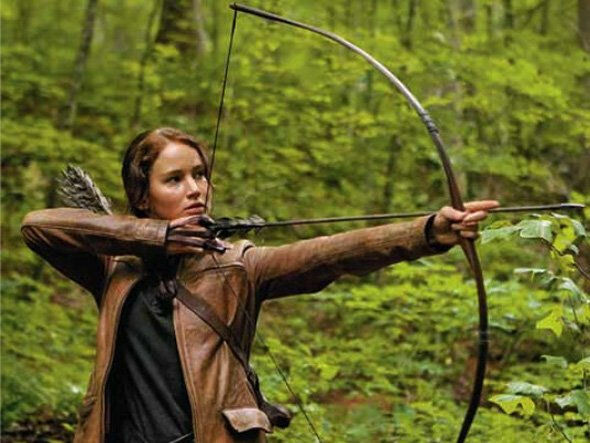 But I’m not enlisting the aid of Katniss Everdeen to fight the College Board over its test. Odd as it sounds, there are some admirable, humane aspects to the SAT in its current incarnation. I’ve just started using the Neo-Roman culture of Suzanne Collins’s Panem setting to work to take the fear out of Latin-derived vocabulary words. One of the pleasures of the Hunger Games trilogy for adult readers is the subtle thread of Roman influence on the world-building. It’s completely lost on the narrator, who has been raised in extreme poverty and educated only far enough to serve a dictatorial state. Since Katniss can’t comment on the classical echoes, and doesn’t need to understand them to navigate her world successfully, teenage readers who haven’t been offered much history earlier than 1776 can get by all right, too. They hang on in the wake of Katniss’s enormous personality and follow her through fire and storm to the end of the last volume. My students do get all the big themes and moods of the story, and all the wild action. The little grace notes that genre readers smile over, well, left to themselves, my students just shrug and treat them as non-specific markers of Panem’s otherness. I ran into Stephen Jones when he and his wife Mandy Slater swung by the Black Gate booth at Worldcon last week. I’ve known Mandy for nearly 30 years, since we were both involved in Ottawa fandom in the early 80s, but Stephen I first met in the early days of running the SF Site. I was an entrepreneur trying to get a website dedicated to science fiction and fantasy off the ground at the dawn of the World Wide Web (1996), and Stephen was a young editor publishing some of the most exciting anthologies in the field, including The Mammoth Book of Best New Horror, Dark Voices, Fantasy Tales, H.P. Lovecraft’s Book of Horror, The Mammoth Book of Vampires, and many others. Many of us grew up on The Pan Book of Horror Stories and its later incarnations, Dark Voices and Dark Terrors (The Gollancz Book of Horror), which won the World Fantasy Award, the Horror Critics’ Guild Award and the British Fantasy Award, but for a decade or more there has been no non-themed anthology of original horror fiction published in the mainstream. Now that horror has returned to the bookshelves, it is time for a regular anthology of brand-new fiction by the best and brightest in the field, both the Big Names and the most talented newcomers. A Book of Horrors is 429 pages in trade paperback. It is published by St. Martin’s Griffin, priced at $15.99 print and $9.99 for the digital edition. You can see more details, including the complete list of contributors, here. Read all of our recent New Treasures articles here. One of our favorite small press publishers, Subterranean Press, have announced an impressive sale on more than 60 digital titles. Until the end of September, all Subterranean Press digital books are available for $0.99 to $2.99, including work by Kelly Armstrong, Peter S. Beagle, Elizabeth Bear, James P. Blaylock, Peter V. Brett, Ted Chiang, Robin Hobb, Barry Hughart, Joe Lansdale, Thomas Ligotti, Brian Lumley, Robert McCammon, Jack McDevitt, Cherie Priest, Mike Resnick, John Scalzi, Lucius Shepard, Lewis Shiner, Robert Silverberg, Dan Simmons, Peter Straub, Michael Swanwick, and Connie Willis. 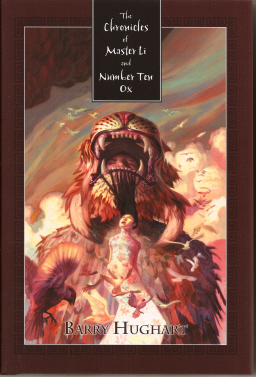 This includes some classic works of fantasy, such as the 3-novel omnibus The Chronicles of Master Li and Number Ten Ox by Barry Hughart, containing the World Fantasy Award-winning Bridge of Birds and both of its sequels; Ted Chiang’s Hugo-Award winning novella The Lifecycle of Software Objects; and his Hugo and Nebula award-winning novelette The Merchant and the Alchemist’s Gate. 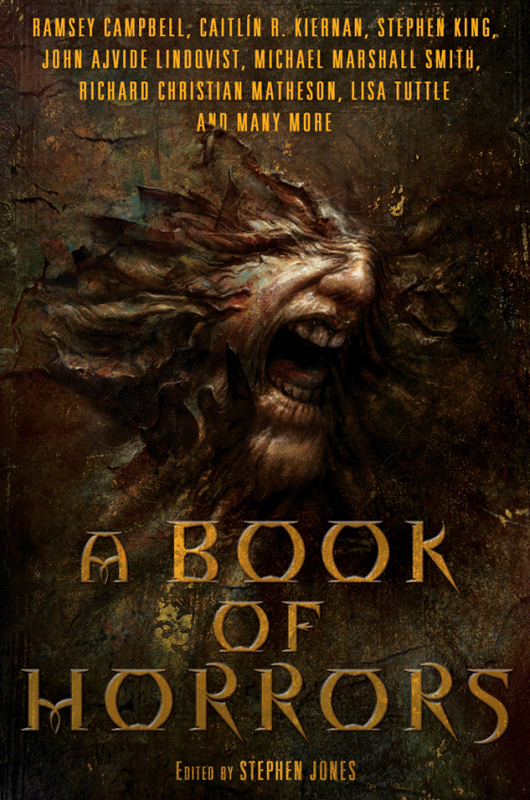 It also includes the classic Grimscribe and Noctuary by Thomas Ligotti, the 500-page omnibus edition of The Adventures of Langdon St. Ives by James P. Blaylock, and The God Engines by John Scalzi. Short fiction lovers have several excellent choices, including The Best of Lucius Shepard; The Collected Stories of Robert Silverberg, Volumes One through Four; In the Beginning: Tales From the Pulp Era by Robert Silverberg; The Best of Michael Swanwick, Cryptic: The Best Short Fiction of Jack McDevitt; The Juniper Tree and Other Blue Rose Stories by Peter Straub; and a collection of Connie Willis’s Christmas stories, All Seated on the Ground. Subterranean Press eBooks are completely DRM-free. You can find a complete list of available titles here.